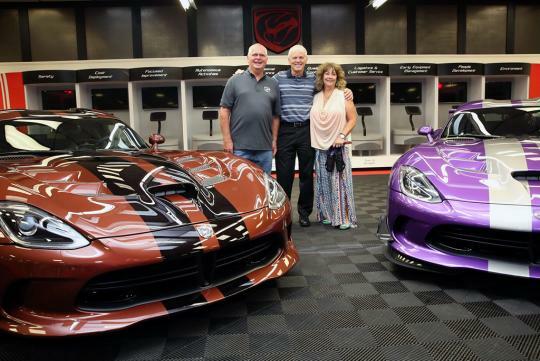 Wayne and D’Ann Rauh from Texas has just collected a pair of customised Vipers, their 78th and 79th ones using Dodge’s '1 of 1' personalisation program. Yes, this two lovebirds are the owners of the largest collection of Vipers in the world. Wayne is seen here with his new brown GTC with black stripes while his wife went for the track-focused TA (Time Attack) variant with a purple paint job. The cars are truly unique according to Dodge as they guarantee buyers that the exact same combination out of 50 million possible combinations won’t be built again in the same model year. 50 million combinations is possible thanks to a choice of 16,000 unique paint jobs and more than 48,000 unique stripe configurations. For those who wonder why would there be Viper collectors out there, one of the reason might be due to the monster that resides under the bonnet : a 8.4-litre V10 pushing out 645bhp and 813Nm of torque.